Using a piece of string to get down to the nitty gritty business to remove that last bit of food or plaque from in between your teeth is not everyone’s cup of tea, but guess what we all have to do it. However, products like the Aquarius Waterpik means it doesn’t have to be a job you hate as it is no longer messy. It can be pretty quick and easy. So What Is A Water Flosser? It is a nice compact device that sprays a thin stream of water at your teeth or gumline and the steady pulses helps to remove those particles and debris quite easily. We go into more detail on our best of 5 buying guide. Since it is an electronic device, it needs to be plugged into a socket while you also need to fill the reservoir regularly with water. They are highly recommended for people with braces or implants, as well those with crowns, bridges, and veneers. Waterpik Aquarius Review: Why this Water Flosser? When it comes to the latest Water Flossers out there, the Waterpik Aquarius Professional is the leading product, and the neat and modern design makes it much easier to move around. It’s as easy as 1-2-3 to use as you simply have to fill reservoir with water, choose your power/pressure setting, put the wand in your mouth, press the power button and then watch as your teeth gets a good a clean out with you barely having to do anything. It gets the job done in a couple of minutes. What Sets the Aquarius Waterpik Apart From Other Water Flossers? It has the latest pulse-modulation technology which is out of the top drawer when it comes to plaque removal, while the Hydro-Pulse Massage Mode helps to improve circulation and massages the gum and who doesn’t like gum massages? Its pressure control system has 10 settings so you are in control of the how powerful you want it while it has a one-minute timer with a 30-second pacer. 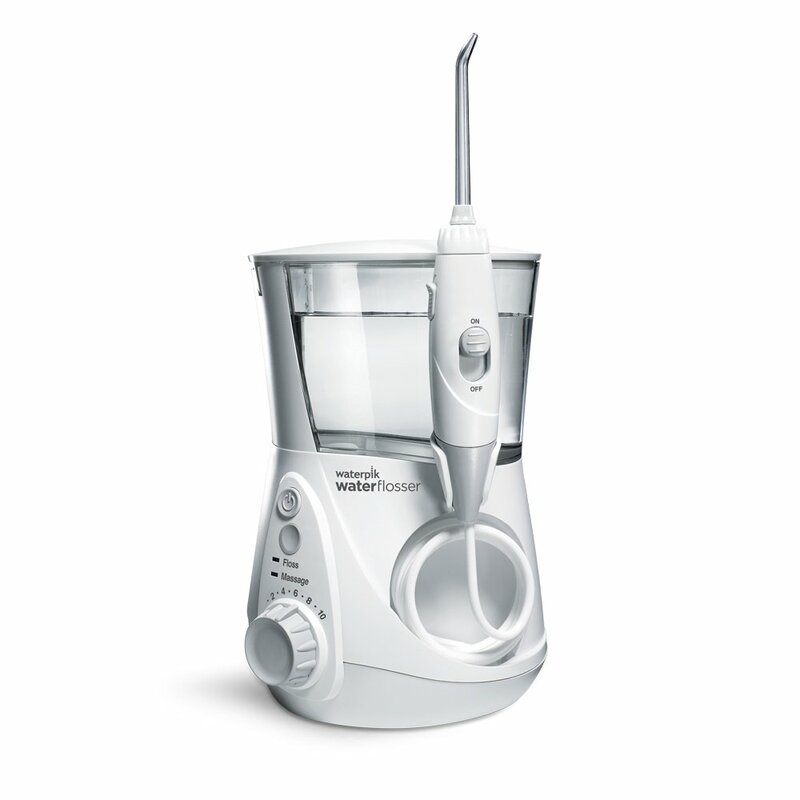 The waterpik wp 660 aquarius professional water flosser has a reservoir capacity that lasts more than 90 seconds and the on-off button on the handle is pretty easy to operate. The small footprint means it fits on the sink in most bathrooms. one Water Flosser Toothbrush Tip. If you want to go all out, you can also buy the Water Flosser Tongue Cleaner and the Water Flosser Tip Storage Case with 6 Tips. You can check out the list of Waterpiks tips and their uses right here. Waterpik Aquarius Review: What’sNot So Good About It? With good old string floss you can just put it in a tiny bag and take it with you on the road whether that be to a gala evening or to a friend’s house, but Water Flossers are too big so it will take extra space in your luggage if you are going to take it with on your holiday, for instance. But you always have an option to opt for the cordless version of Waterpik. The motor can be a little noisy if you are going to use it when someone is sleeping in the room next door. The higher the pressure setting, the noisier it becomes unfortunately. Also, unlike its predecessor the Waterpik Ultra, the Aquarius storage unit is not the biggest so you can only store three tips at a time and the water reservoir doesn’t hold a lot of water. If you are too lazy to use a piece of string to floss, then the Aquarius Waterpik will make your life a lot easier, especially if you have braces as well as those with crowns, bridges, and veneers. It does get to that last bit of food that’s stuck deep, sometimes leaving you surprised what comes out of your mouth. It also gives your gums a good message, leaving your mouth with a fresh and clean feel and who doesn’t like that? But ultimately when going out to buy a Water Flosser, it comes down to personal preference. Sometimes it can be the color of a product, other times the different pressure settings, like with the Waterpik Aquarius Professional, makes all the difference to you personally. Time is not on our side, if a water flosser does the job faster and better than traditional string flossing. Why not grab it? Since time is not always on our side, we had to make this Waterpik aquarius review as short, sweet and straight to the point as possible!